Nothing can compare to the graceful elegance of pure white Phalaenopsis in white porcelain vessel in full bloom. Their popularity helped to increase the worldwide demand for orchids. Phalaenopsis white orchids are among the easiest plants to grow indoors. Placed next to a simple piece of furniture, their subtle glow will illuminate the room. 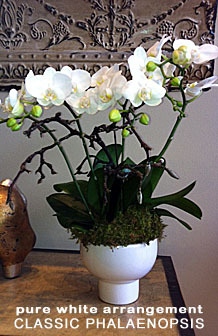 Arranged a collection of three orchids in one simple container, it makes a stunning gift. Click image for more options.